Uranus, the Rebel. Not to scale obv. 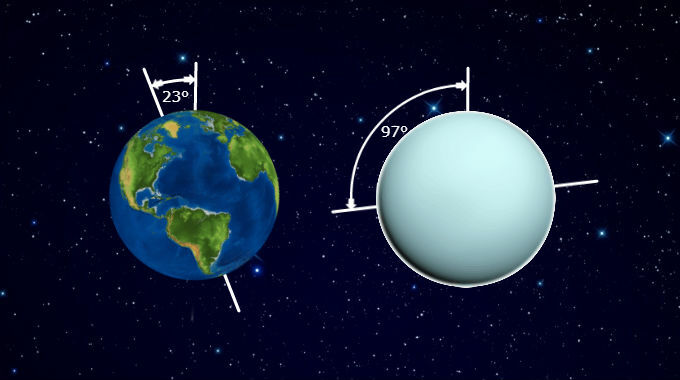 Uranus is the first planet beyond the regular limit of visibility to the unaided human eye on Earth, only visible in opposition with the Sun and only discovered through the human ingenuity of the telescope. Its rotational axis is so extreme that it doesn’t just orbit around the Sun like the other planets, it rolls! Accordingly, Uranus represents the transcendence of ordinary limits, signifying liberation, freedom, individualism, revolution, progress and disruptive technology. The condition of Uranus at the time of our birth shows what role we may play in our 7-year generation’s revolution in the topics of its sign and house placement. Uranus disrupts, inverts, revolutionizes, technologizes and radicalizes the topics of the signs it transits through.